AFRC Home Screen – Welcome to the EMIT Technical Forum! 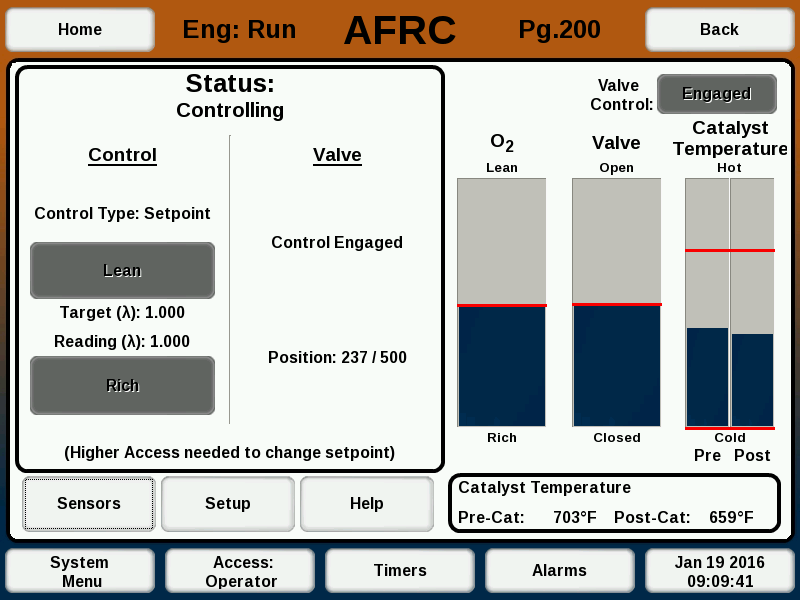 The AFRC Home screen provides all the necessary information and functionality to select the target setpoint, adjust the valve, enable/disable control, and access additional setup features. The left side of the screen is broken up into boxes which represent control for the individual banks of the engine. The right side of the screen provides a visual indication, through bar graphs, of the oxygen content of the exhaust, valve position, and catalyst temperatures. A security mode of Setup or Engineering is required to make any adjustments or changes to this screen. Selecting the “Control:” toggle button in the upper right corner toggles the valve control mode of the AFRC between “Engaged” and “Manual”. The mode currently displayed within the button is the active mode. The control boxes for each bank contain the status of the control, target setpoint of the sensor, actual reading of the sensor, and valve position. The “Rich” and “Lean” buttons adjust the target setpoint accordingly, and the “Open” and “Shut” valves adjust the valve position accordingly. 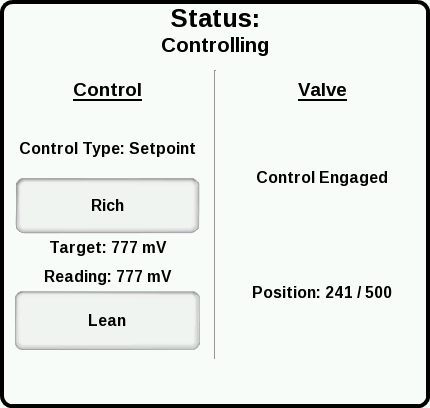 When the control is in “Auto” mode, the “Open” and “Shut” buttons are disabled as the controller automatically adjusts the valve position to match the actual sensor reading with the desired target setpoint. The target setpoint value can be adjusted in either “Auto” or “Manual” control mode. If the AFRC Advanced is in “Auto Control” mode, the “Lean” and “Rich” buttons are not displayed. The “O2” bar graph displays the oxygen sensor readings in real time. Wideband sensors show richer values towards the bottom and leaner values towards the top. Narrowband sensors show richer values towards the top and leaner values towards the bottom. The graphs are labeled accordingly based on the sensor being used. Dual bank configurations will show two “O2” bar graphs, one for each bank, while a single bank configuration will only show a single bar graph. Red markers indicate the target setpoint of the bank. The “Catalyst Temperature” bar graph displays the real-time readings for the pre-catalyst and post-catalyst thermocouples. Red markers indicate temperature alarm values configured. Any of the three bar graph areas on the AFRC Home screen can be selected to go to a short-term graph of the values along with some statistics. The "Go to Datalog" button can be selected to graph longer-term values of that input. 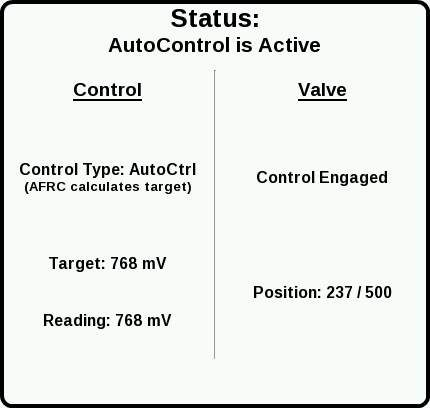 The AFRC valve(s) can be automatically or manually calibrated to a known “home” position. By default the home position is set at 249 steps, or in the middle of the valve range. The AFRC home position can be either saved on "Manual" to "Engaged" control transition, or can be user-defined. To set how the home position is saved, select "Setup" on the home screen followed by "Valve Home Position(s)". The value will automatically calibrate or home to these positions after the engine run signal toggles from “Run” to “Off”. Alternatively, the valves can be manually homed by selecting the “Home Valves” button while in Engineering security mode and in “Manual” control mode. The smaller box under the bar graphs display real-time readings of the catalyst thermocouples. The “Sensors” button provides access to the Sensors screen (Lite Pg. 320, Adv. Pg. 220), which displays real-time readings for all the sensors that are connected to the AFRC and are enabled. The “Setup” button provides access to additional configuration options for the AFRC including “Run Signal Trigger”, “Sensor Setup”, “Alarm Setup”, “Engineering Setup”, and “Mapping Setup”.